Here's a set comprised of RCA and American Columbia recordings that may go unnoticed. One would think that the set is largely comprised of music BY Erik Satie. Such is not the case. Some CDs are comprised of all Satie, others only have selections. 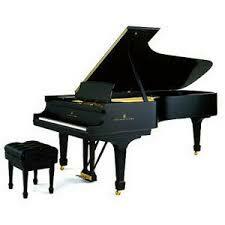 Some reviews by buyers were not pleased because it is NOT an all-Satie set. Doesn't matter, there are lots of things from old LPs, some of which have never seen the light of day before on compact discs. "Erik Satie, that endearing French revolutionary, has been credited with starting European musical history all over again. In 2016 the musical world celebrates his 150th birthday. 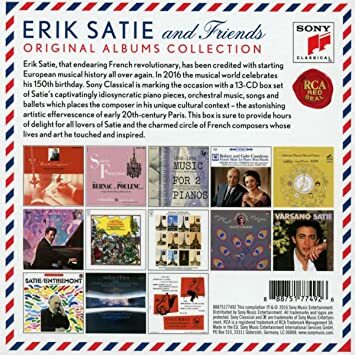 Sony Classical is marking the occasion with a 13-CD box set of Satie's calculatingly idiosyncratic piano pieces orchestral music, songs and ballets, which places the composer in his unique cultural context — the astonishing artistic effervescence of early 20th-century Paris. 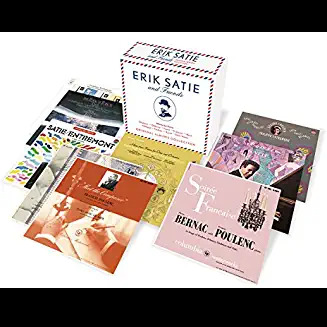 This box is sure to provide hours of delight for all lovers of Satie and the charmed circle of French composers whose lives and art he touched and inspired." That said, from the LP covers shown above, you may well recognize some of the albums included in this compilation. The artist roster of those included is top-drawer. You will find Pierre Bernac and pianist Francis Poulenc from two old LPs, piano music by Gold & Fizdale, duo pianists, Gaby and Robert Casadesus in one piece, Gymnopédies I/II with oboist John de Lancie under André Previn's baton, a full album of piano music from William Masselos, a full album of orchestral music led by Philippe Entremont, another with Gymnopédies I/II/II again led by Entremont with orchestra, a song recital with Regine Crespin in eight songs by Satie, this time Entremont at the piano (with other music by Ravel), a piano recital of all-Satie with Daniel Varsano, a full piano recital of all-Satie with Entremont at the piano, an album entitled "The French Touch" with Charles Gerhardt conducting the Gymnopédies I/II, and finally an early LP of Gaby and Robert Casadesus performing Satie's Three Pieces in the Shape of a Pear (re-recorded in stereo mentioned above). This last disc also offer Saint-Saens' Piano Concerto No. 4 with Robert Casadesus and the NYPO under Artur Rodzinski. CD 13 contains some surprises added due to the length of the original LP. These include two Satie songs sung by mezzo-soprano Jennie Tourel, George Reeves at the piano; Gymnopédie 1 with Koussevitzky leading the Boston Symphony, Satie's Parade (ballet, abridged) with the Houston Symphony led by Efrem Kurtz, and Koussevitzky again leading the Boston Symphony in Gymnopédies 1/2 (different recording apparently that No. 1 shown above). The excellent booklet notes by Caroline Potter gives us good insight into the life and friends of Erik Satie. I found the Pierre Bernac with Francis Poulenc at the Baldwin material of great interest, recorded in America, and there is much to enjoy in all this collection for just about everyone. The set can be had new for around $24 + post, and higher by a few $$$ from Amazon. But why do I have the feeling this is a set that will not be around for long? But why do I have the feeling this is a set that will not be around for long?